Piet Mondrian developed the language of abstract painting as we know it today and his studios were integral to his way of working. In 2014 his Paris studio was meticulously reconstructed for the exhibition Mondrian and his Studios at Tate Liverpool. Curator Michael White shows us around the exhibition and discusses how Mondrian hoped his paintings, and by extension his studios, would not only create dynamic spatial relationships but even point to a new way of living. Mondrian is one of the most important artists of the twentieth century. He developed the language of abstract painting as we know it today. It didn’t really exist before his practice. So, we’re standing in the reconstruction of his studio, which he occupied from 1921 to 1936. It became one of the most celebrated places in post-war Paris. He had a section here around the door where, for a short time, Mondrian exhibited a number of his, kind of, key paintings. By the time we get to Composition II all of that contrastive reference to motifs has, kind of, disappeared. So, this is like a little narrative of moving finally into an abstract world set in this extraordinary studio space. It’s a really interesting question he’s posing himself here is that, can you use colour just as itself and not to stand for anything else? If you made yellow into a circle immediately people start making associations with the sun or something like that. So, he decides that the only way forward is to paint in areas of perpendicular relationships that, you can still see that he’s actually mixing the colour really very dramatically. So the yellow is going almost towards the green, the red towards an orange. He’s really still not quite, kind of, happy with using them in these, kind of, dramatically dense ways. So, here we have compositions from the mid-1920s. This is when Mondrian’s really, kind of, hit his stride. He was very, kind of, interested in how to balance things that actually were unbalanced. See, the pushing of elements to the edge where actually have a complete empty centre. But what’s really, kind of, fascinating about what’s going on here is exactly that area there and how you read that as a definite shape. And it’s really, really crucial that you don’t read the white just as an empty background. Actually, the whites are very, very carefully built-up.This is actually a very pale grey, blue, and it’s different to that and that is different to that. They actually stand for something in and of themselves. 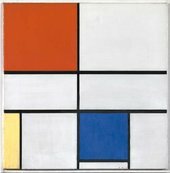 A lot of people think about Mondrian’s paintings as just flat and graphic. However you start to see them as creating very, kind of, dynamic spatial relationships and where things then start to seem to push off the edge and actually into our space. And where he’s thinking about his studio then is actually as a type of abstract space that he might be creating through painting. He thought that this was part of the development of humanity generally, that we would create a, kind of, different world and environment for ourselves. Most people thought this was of the end of painting. What he was producing here was the ultimate point. And so people thought about him really at the end of his career. We think about these paintings now as the beginning. Actually, this is point at which he Mondrian and he proved over and over again that actually there was much further to go with it.